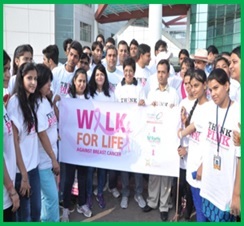 To help spread awareness for Breast Cancer, Fortis Hospital, Noida hosted a Pink Walkathon, a 4 km walk organised for cancer survivors, RWAs and school girls. ‘Early detection of cancer save lives’ was the message reinforced by community residents who walked the Pink Walk. Dr. Kiran Bedi graced the occasion as the guest of honour and encouraged women to go for regular check-ups in detecting early signs of this life threating disease. The oncology team lead by Dr. Jalaj Baxi, Senior Consultant, Surgical Oncology was present at the event and spoke to women on the early detection. Dr Kiran Bedi in addition to inauguration of the walk, also unveiled Wish Well, kicking off the ten year anniversary celebrations for FHN. The wish well, drew maximum attention of the people, on the first day and continues to be the star attraction.